You know, I really like this kind of sheet. It gives a variety of planes on one sheet and generally, they are quite colorful. 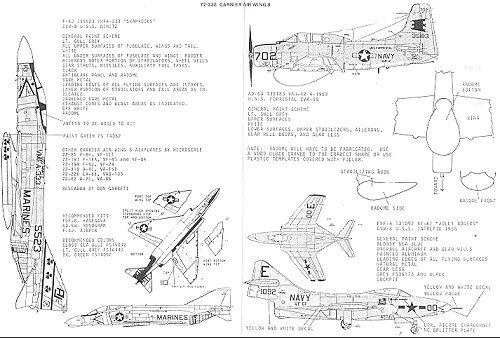 This particular sheet is for Carrier Air Wing 8 and covers several eras. First is an F9F-8 from the USS Intrepid in 1955. This VF-61 aircraft is overall dark sea blue with yellow trim. It is fortunate for us all that there is an excellent kit of this plane in 1/72 by Hasegawa. Next is an AD-5W of VAW-13 from the USS Forrestal in 1960. Doing this one will be a bit more work and requires a Monogram A-1E and either some scratchbuilding or one of the Falcon conversion sets. It is in light gull grey over white. A set of drawings is supplied as a guide in case you want to fabricate the radome. Finally, an F-4J from VMFA-333 aboard the USS Nimitz. 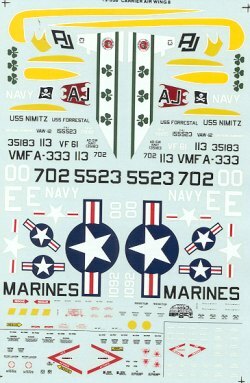 The recommended kit is the Airfix F-4J, so that tells you how old this sheet is. Since then, there have been F-4Js from Monogram, ESCI, Italeri, Fujimi and Hasegawa, all better than the Airfix version by far. There are common markings for most all the planes, but I'm a bit concerned about the huge national insignia. I'm thinking they are supposed to be for the F-4, but they seem more like 1/48 scale than what you'd use on a 1/72 kit.